After a speaking engagement last week in Atlanta, a dentist asked me how I would rank the various places where patients can review his practice. I thought my answer would be of general interest. I will again use my friend Dr. Craig Spodak’s results to show you. See how he has 89 reviews? Also note that someone can click next to that count and write their own review. The more reviews you have, the better you will come up on Google in a natural (unpaid) search. #2. Your Own Website. This is the next place people are likely to look for reviews (and Google will also be searching your site for them, which will boost your website’s SEO). This means you have to have a website that is dynamic. That word means something specific in the web world–that is, that you can add and change information yourself, rather than having to use your webmaster. You need to be able to add photos, video, your blog (if you’re doing one) and especially patient reviews and testimonials. This requires you to solicit those reviews from your patients, and then post them yourself. Or, much more simply, you could use a digital communication application like Patient Activator, that has as one of its features automatic patient surveys. This application will email patients three days after their visit and ask them to respond to a short survey, and encourage them to write a review of the practice. It is then posted to a microsite of your practice (more SEO for you), and you can also use the reviews you like on your own website, and also pop them onto your Facebook fan page. #3. Yelp. The usage of this business review site varies widely city by city, but more and more people are posting reviews about everything, including dentists. About 70% of US dentists have at least one review, I’ve been told. You want to invite your patients to do this, ideally while in the office. The best way is to get a few tablet computers for them to use, as I suggested in a previous blog. One key point: Yelp gives preference to reviews that are written by frequent reviewers on their site. This means that if a patient doesn’t normally review on Yelp, the review might not appear, or will not float to the top. Yelp does not list your reviews chronologically, but by a combination of rating and some more mysterious elements. #4. Facebook. This is not technically a review site, but patients can now write “recommendations” on your Facebook fan page, and these are shown separately. 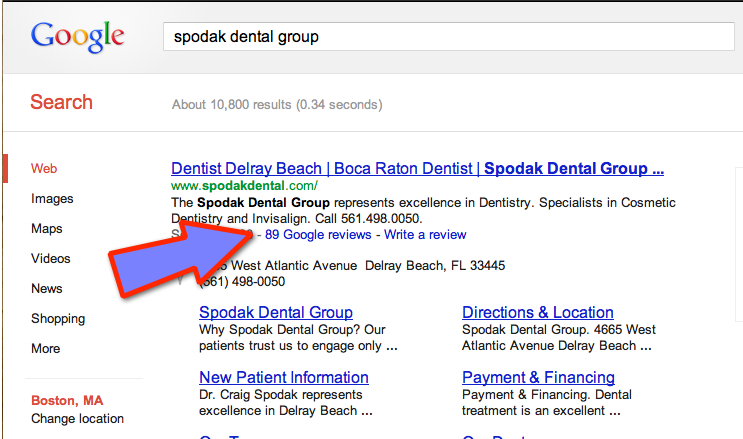 One glitch–if you have not properly categorized your dental practice there will not be a place for recommendations. I also don’t feel like people use Facebook to see recommendations that much, but rather go to your fan page to see what people post about you, or what you and your team post about yourself. You should use iPads to get patients do post here as well while they are in the office. #5. Everywhere Else. Angie’s List, LinkedIn, CitySearch, Dr. Oogle all have reviews. Angie’s list is probably the next most important place, but reviews can only be read by subscribers, and only subscribers to the site can post reviews. It narrows the audience considerably, and also the number of your patients who could review you there. The site does a wide range of businesses, while Dr. Oogle is strictly health care, but the latter site gets significantly less traffic than all the others. Reviews will matter more and more, so now is the time to focus on them, but make sure you are getting them in the most advantageous places. And remember, you don’t need hundreds of reviews. No one would read that many. But you need a steady stream of fresh ones. Even two a week will add up quickly, and help with your SEO, but I would aim for one a day, and you’ll be well on your way! This entry was posted in Advertising, Dental Marketing, Dentistry, Online Reviews, Practice Management, Social Media, Uncategorized, Websites and tagged advertising, dental marketing, dental practice management, dental practice marketing, Facebook, Google, Online Reviews, social media, websites, Yelp by Fred Joyal. Bookmark the permalink. Great Post…Very Informative. Now following. This is surly the way to go. Thank you for the great suggestion.